This is gonna be Awesome….!? Huh!? Maybe I should just get it out there, instead of waiting for the magic to pop into my head and out through my keyboard! a place for me to share with you and for you to share with me! I’d love to share my thoughts and joys of mommin’ in hopes of helping other new parents… though I’m anxious that I won’t be able to get my thoughts and emotions out, for fear of becoming too emotional… ha! I’d like to write about how I was near 39 years old (!) when we were surprised by the excitement of a pregnancy! That my little dude is a true joy (seriously, a true joy!) but, man, I didn’t know this mommin’ thing was actually kind of difficult! That my little guy walked at 9.5mths and that sort of added to the difficulty, hee hee! That I was scared as crap to give birth! That my baby’s birth was, actually, quite ‘easy’ and miraculous and amazing! That I sometimes get bored being a stay-at-home mom! That I sometimes only want to just sit on the floor and watch my boy explore, learn, and babble at me! That my baby’s huge, cheeky smile and accompanying laugh is easily the best thing I get to see and hear all day long… it’s so amazing I sometimes just want to cry from the sheer joy if it! That, of the three blogs I keep right now, this… this is the one I want to nurture, as I nurture my little guy… for it to grow into something wonderful and amazing! Hey… I think maybe I’ll be able to do this afterall! I greatly enjoy writing reviews and here I’d like to continue that in the hopes that I might share information about something that can help another parent. All of this focused on the topic of Mommin’ from (near and/or around) Bend, Ore! Hmmm, just kind of Mommin’ in General… ya know, all the hard work we do and how we do it and why! So, you don’t really have to be a Bend Parent to find enjoyment and resource out of my blog! If you’ll take this ride with me… I’ve got a seat for you! Mama (E’lan) Bendia signing off… For now! 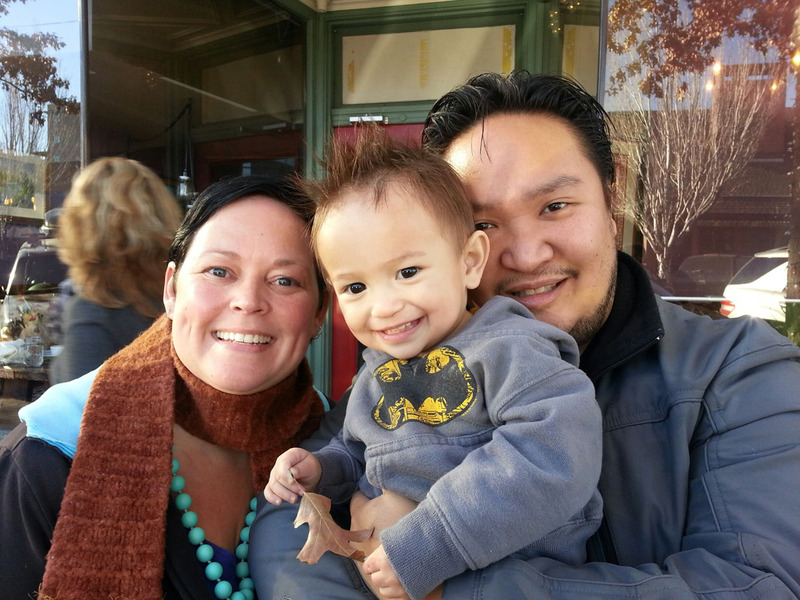 My wee family, during 2013 Holidays, making a home in Downtown Bend, Ore.
First off~ I love the concept of this blog ‘just being a mom in Bend’. Lovely ideas and suggestions and questions and the fun and wonderful life in Bend that we are so blessed be a part of. And sharing that in this blog that you’ve created. I’m really excited to see how it grows. Peace, Joy, and Love to you and your family Mama Bendia! Welcome to Central Oregon ~ the best place (I think) ; ) to raise our children and to call home. I love being a mama, I love to write, so this is a perfect little venue for me bringing these things together… the adventure of living in our new home town! Seems like a great place for kids, indeed! Best to you! Take care! Finally a blog from a local Mama! I felt like you were talking to me face to face when I read your blog…and we have never even met…yet! I certainly do look forward to meeting lots of other local mamas and their babes! Hopefully someday that means we will, indeed, meet!? Thanks!! Ah, man, miss you also!